The Great Canadian Meat Company was founded back in 1992 in Whitby, Ontario, Canada as a two-man operation with one product: our Authentic Dry Pepperoni. Since then, we have expanded the brand to include the largest selection of shelf-stable meat snacks in Canada: featuring pork, beef, chicken, turkey and venison. Since our enormous success with the Great Canadian brand, we have introduced our Kurtzie’s Gourmet Deli selection, featuring our specialty European style charcuterie and Salami products. 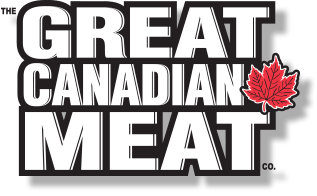 The Great Canadian Meat Company has continually strived to create one of Canada’s premiere snack food experiences and we pride ourselves on being a Canadian company using the finest Canadian ingredients whenever possible. We source our pork from Quebec and our beef from Western Canada – ensuring the purest of meats from within our borders. We pride ourselves on processing through a federally inspected, HACCP approved, state of the art facility and by sourcing within Canada we’re solidifying our role as a true Canadian company producing high quality, tasty meat snacks for our valued customers. Whether it’s at your local corner store or high above the clouds, Canadians everywhere continue to support our homegrown brand – today and always, from coast to coast to coast.